We think these three companies could easily double investors' money. There's something magical about owning a stock and watching it double in value. Often, the best way to capture these kinds of capital returns is by investing in companies with great growth potential -- growth stocks. In our never-ending search for companies with double-your-money growth potential, we asked three of our top contributors to write about a company they like for its growth prospects. They offered up ServiceNow (NYSE:NOW), Tile Shop Hldgs, Inc. (NASDAQ:TTS), and TASER International, Inc. (NASDAQ:AAXN). We think these stocks can really grow your money. Image source: Getty Images. The best part? If these three companies continue doing what they're great at, they have the potential to do much more than just double your money over the long term. Keep reading to learn what we love about these three growth stocks. Jason Hall (Tile Shop Hldgs, Inc.): When most people think of home-improvement retailers and consolidation, the first impulse is that Home Depot and Lowe's have pretty much sewed up the market, right? And while there's some truth to that, considering that both companies have thousands of stores with tens of thousands of products available, neither company offers the kind of selection of flooring and tile that many customers are looking for. This is why nearly every medium-sized town in America has a local tile retailer, and many of these operations generally have no more than a handful of stores within a small geographical area. This presents Tile Shop Holdings with a wonderful growth opportunity. The reality is, the company already has big enough scale to outcompete many smaller operators. Its purchasing volumes, lower-cost distribution, and ability to invest more on marketing, are very real competitive advantages against the bulk of its potential competition. Factor in a current size that's tiny compared to the addressable market -- Tile Shop has less than 125 stores at this writing -- and the company has a lot of room to run. Its shares may be a bit pricey at 34 times next year's earnings, but CEO Chris Homeister and his team have done an incredible job positioning the company for years of steady, profitable growth. 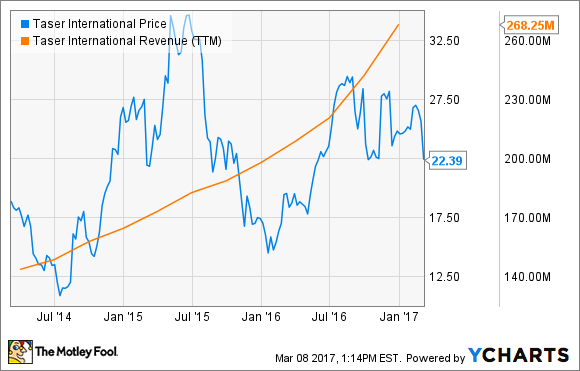 Long-term investors could do very well to hold Tile Shop shares for many years. I'm expecting much more than just doubling over the next decade and change. Travis Hoium (TASER International): One company that's making all the right moves, but still can't get any love from the market, is TASER International. The manufacturer of tasers and body cameras is seeing adoption of its products go through the roof -- and yet the stock can't get any traction. Weapon sales are still the bread and butter for TASER International, and revenue jumped 25% in the fourth quarter, to $58.3 million. But Axon body cameras are really the future, and that's where revenue surged 154% last quarter, to $23.7 million. The great thing about body cameras is that they often are accompanied by an Evidence.com cloud services contract, which usually runs many years in length and has traditionally seen gross margin of around 80%. The downside for the company has been profitability, which has been hurt by investments in sales and research and development (R&D) to grow the business long term. But with the kind of growth you see above, and the margins in weapons (69%) and body-camera services, the bottom line should begin improving rapidly. And when it does, the stock could follow suit, which is why I think this is a growth stock that could double in short order for investors. Is NOW the time to get in on this growth story? Brian Feroldi (ServiceNow): Software-as-a-Service companies have been all the rage with investors in recent years, and it's not hard to figure out why. These companies sell online software subscriptions instead of a big one-time licensing fee. Companies like this because it lowers their up-front costs, and frees them from having to manage their own databases. That's terrific for SaaS providers because customers quickly become dependent on the software to run their day-to-day operations. In turn, SaaS providers benefit from high renewal rates and a growing source of recurring revenue. One SaaS company that I have my eye on is ServiceNow. This company helps other businesses to become more efficient by providing software that helps them to automate their workflow. ServiceNow's software is aimed at providing rapid communication and data management for departments like human resources, IT, customer service, security operations, and more. ServiceNow's product offerings have proven to be a massive hit in the marketplace. Last year, this company hauled in more than $1.4 billion in revenue, which was up a strong 38% over the prior year. That's an impressive figure for a company that was only founded in 2004. 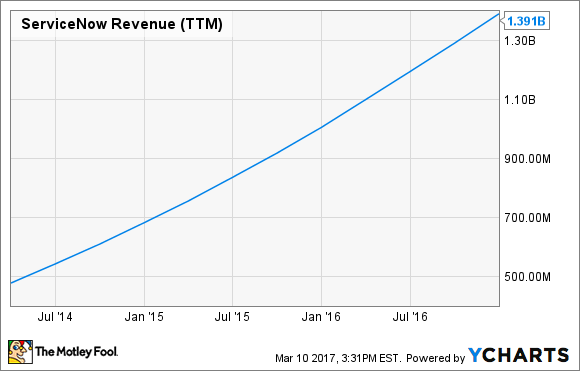 Despite its torrid growth rate, ServiceNow believes that its top line will exceed $4 billion by 2020. If ServiceNow can even come close to hitting that target, it wouldn't surprise me to see this stock double. While the company itself is on fire, there's a potential wrinkle that investors should be aware of. The company just had a changeout in its top chair. John Donahoe, the former CEO of eBay, recently took over, which was news that came as a bit of a shock to investors. While it's unknown if the turnover will cause ServiceNow's growth to pause, there's no doubt that this business is built for growth. That makes this a great stock for growth investors to put on their radar.